Since you have shown us your love for the Mediterranean cuisine and especially the Greek cuisine, we thought of bringing you The Olive Street Food, so you can enjoy your favorite tastes anytime and anywhere you wish. 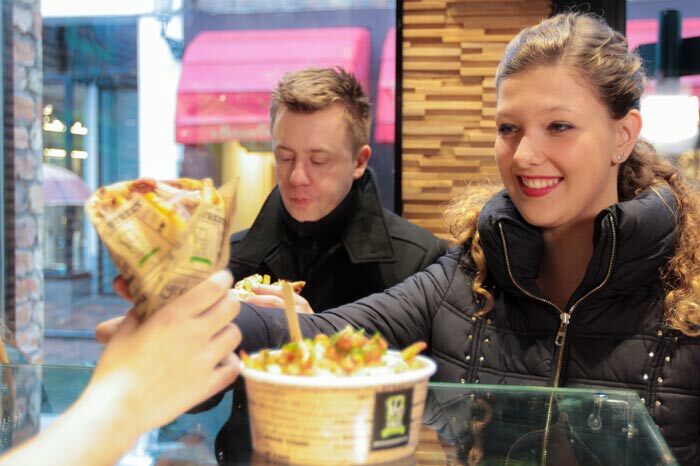 The Olive Street Food has been designed in such a way so as to comprise the ideal spot where each visitor can get their meal and enjoy it anywhere they like, whether it be fast with a swift return to work, take it to or have it brought at home, or enjoy it during a break. The Olive Street Food is not another typical grill-house that offers exclusively souvlaki and gyros. It offers choices for all tastes, so that it covers as many taste demands as possible. There are plenty choices for meat and fish lovers, vegetarian, gluten free and vegan meals, as well as suggestions for diabetics. The outstanding and modern space at The Olive Street Food has become a hot spot for the lovers of gyros, souvlaki and Greek tastes, offering extraordinary dishes and handmade products which are made on the same day in the shop from the purest Greek ingredients, and are based on simple traditional recipes. Our philosophy is to make and serve food that we ourselves eat with our families.Taste, quality, quantity and price, all combined in harmony to offer you the ideal culinary experience. Using fresh meat from a local producer, the extra virgin olive oil “The Olive Oil” from the island of Lesvos, A' quality vegetables and freshly cut potatoes fried in olive oil, Greek pita bread from the most established producers in the field of traditional pita bread, we have transformed gyros and souvlaki from a guilty pleasure into the juiciest and healthiest fast food in Bruges. For this reason, there is nothing precooked in our shops!We choose products of exceptional quality which are cooked on the spot! We choose A' quality potatoes which we peel and cut on a daily basis!Our salads are freshly cut and we use extra virgin olive oil! We combine 4 different choices of fresh juice from the Vitamin Bar for you to complete your healthy meal and have all the vitamins your body needs.